The Celluloid Sorceress proudly presents a revisionist masterpiece, overlooked upon release, that has grown in stature and is considered by many among the finest epics of the 1980s. The Bounty (1984) is presented from a rare US 35mm print. The fifth big screen telling of the Mutiny on the Bounty is by far the most accurate. Forgoing the traditional “rebel with a cause” story of good triumphing over evil, master screenwriter Robert Bolt adapts Richard Hough’s 1974 book Captain Bligh and Mr Christian, using dialogue from Bligh’s own captain’s log and transcripts from his court martial. 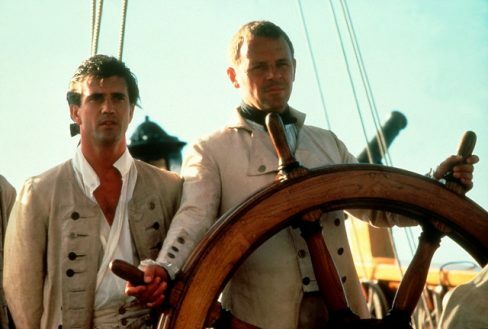 Examining the friendship between Captain William Bligh (Anthony Hopkins) and Master’s Mate and mutineer Fletcher Christian (Mel Gibson) as well as Bligh’s trial and eventual commendation for exemplary seamanship, The Bounty is worthy of the writer of Lawrence of Arabia (1962), Doctor Zhivago (1965) and A Man for All Seasons (1966). Developed by Bolt with Sir David Lean for over a decade and originally intended as a film in two parts, The Bounty was eventually directed by Australian Roger Donaldson. Stunningly photographed by Arthur Ibbotson and with one Vangelis’s finest score it also stars a stunning array of British talent including: Daniel Day Lewis, Liam Neeson, Philip Martin Brown, Bernard Hill, Phil Davis, Neil Morrissey, John Sessions, Dexter Fletcher, Edward Fox and Laurence Olivier. We are excited to welcome editor Tony Lawson (Straw Dogs (1971), Barry Lyndon (1975), Bad Timing (1980)) to the Cinema Museum to talk about The Bounty and his career in conversation with host Rebecca Nicole Williams.